Sometimes a picture is “How on earth did you do that”? People often remember a startling or surprising first impression. Riverdance when they first appeared during the voting interval during Eurovision 1994. 19-year old Everton substitute Wayne Rooney being put on the pitch against a season-long unbeaten Arsenal side, and scoring. A young David Beckham doing likewise against Wimbledon from the half way line. Or Doug Flutie, Quarterback for Boston College, throwing the winning touchdown in a Rose Bowl final from an incredible distance with no time left on the clock. There is even a road in Boston called “Flutie Pass” named in memory of that sensational hail mary throw. There are always lots of pressures on IT Managers and their staff, with tightening budgets, constrained resources and a precious shortage of time. We used to have a task to try and minimise the friction these folks had in buying Enterprise IT products and services from us or our reseller channels. A salesperson or vendor was normally the last person they wanted to have a dependency on for basic, routine “stuff”, especially for items they should be able to work out for themselves. At least if given the right information in lucid form, concise and free of surprises – immediately available at their fingertips. The picture was one of the ones we put in the DECdirect Software Catalogue. 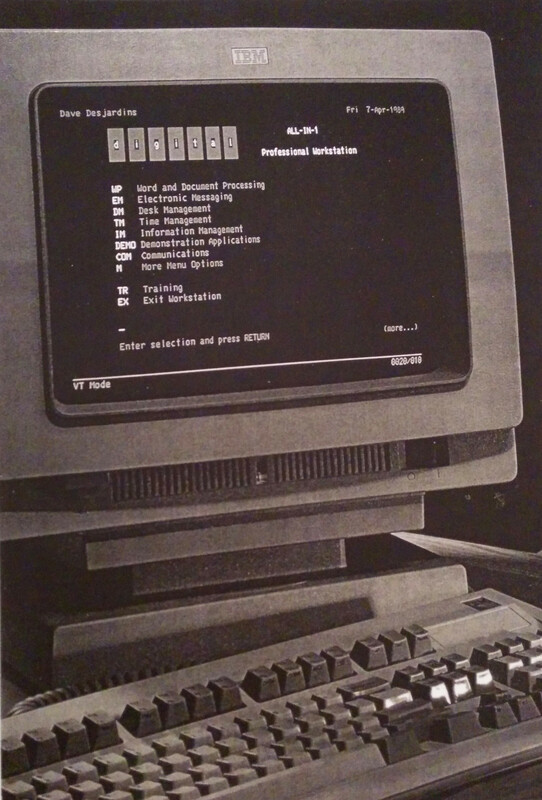 It shows an IBM 3278 terminal, hooked up to an IBM Mainframe, with Digital’s VAX based ALL-IN-1 Office Automation Suite running on it. 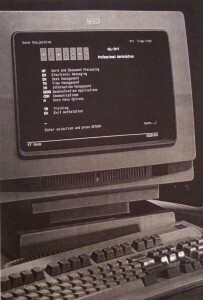 At the time, this was a startling revelation; the usual method for joining an IBM system to a DEC one at the time was to make the DEC machine look like a remotely connected IBM 2780 card reader. The two double page spreads following that picture showed how to piece this, and other forms of connections to IBM mainframes, together. The DECdirect Software catalogue had an aim of being able to spit out all the configuration rules, needed part numbers and matching purchase prices with a minimal, simple and concise read. Our target for our channel salesforce(s) was to enable them to extract a correct part number and price for any of our 550 products – across between 20-48 different pricing tiers each – within their normal attention span. Which we assumed was 30 seconds. Given appropriate focus, Predictability, Consistency and the removal of potential surprises can be designed in. In the event, that business (for which I was the first employee in, working alongside 8 shared telesellers and 2 tech support staff) went 0-$100m in 18 months, with over 90% of the order volume coming in directly from customers, correctly priced at source. That got me a 2-level promotion and running the UK Software Products Business, 16 staff and the country software P&L as a result. One of my colleagues in DEC Finland did a similar document for hardware options, entitled “Golden Eggs“. Everything in one place, with all the connections on the back of each system nicely documented, and any constraints right in front of you. A work of great beauty, and still maintained to this day for a wide range of other systems and options. The nearest i’ve seen more recently are sample architecture diagrams published by Amazon Web Services – though the basics for IT Managers seeing AWS (or other public cloud vendors offerings) for the first time are not yet apparent to me. Things in the Enterprise IT world are still unnecessarily complicated, and the ability to stand in the end users shoes for a limited time bears real fruits. I’ve repeated that in several places before and since then with pretty spectacular results; it’s typically only a handful of things to do well in order to liberate end users, and to make resellers and other supply channels insanely productive. All focus then directed on keeping customers happy and their objectives delivered on time, and more often that not, under budget. One of my friends (who works at senior level in Central Government) lamented to me today that “The (traditional vendor) big players are all trying to convince the world of their cloudy goodness, unfortunately using their existing big contract corporate teams who could not sell life to a dying man”. I’m sure some of the Public Cloud vendors would be more than capable to arm people like him appropriately. I’d love to help a market leading one do it. Footnote: I did a previous post on what Vendors, Distributors and Resellers want here. He was asked “What was it that turned Tesco from being a struggling supermarket, number three retail chain in the UK, into the third largest retailer in the World?”. He said: “It’s quite simple. We focussed on delivering for customers. We set ourselves some simple aims, and some basic values to live by. And we then created a process to achieve them, making sure that everyone knew what they were responsible for”. Silence. Polite coughing. Someone poured out some water. More silence. “Was that it?” an official finally asked. And the answer to that was ‘yes’. The book is a good read and one we can all learn from. Not least as many vendors in the IT and associated services industry and going in exactly the opposite direction compared to what he did. I was listening to a discussion contrasting the different business models of Google, Facebook, Microsoft and Apple a few days back. The piece I hadn’t rationalised before is that of this list, only Apple have a sole focus on the end user of their products. Google and Facebook’s current revenue streams are in monetising purchase intents to advertisers, while trying to not dissuade end users from feeding them the attention and activity/interest/location signals to feed their business engines. Microsoft’s business volumes are heavily skewed towards selling software to Enterprise IT departments, and not the end users of their products. 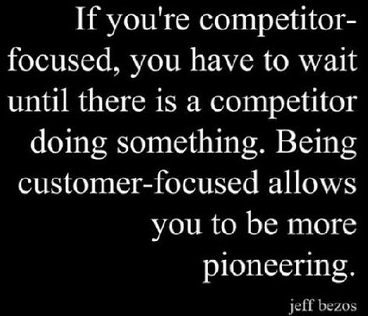 One side effect of this is an insatiable need focus on competition rather than on the user of your products or services. In times of old, it became something of a relentless joke that no marketing plan would be complete without the customary “IBM”, “HP” or “Sun” attack campaign in play. And they all did it to each other. You could ask where the users needs made it into these efforts, but of the many I saw, I don’t remember a single one of those featured doing so at all. Every IT vendor was playing “follow the leader” (and ignoring the cliffs they may drive over while doing so), where all focus should have been on your customers instead. There isn’t one! It’s a focus on the needs of any overworked small business owner, where the precious asset is time and business survival. Trading blows trying to sell one computer over another completely missing. I still see this everywhere. I’m a subscriber to “Seeking Alpha“, which has a collection of both buy-side and sell-side analysts commentating on the shares of companies i’ve chosen to watch. More often than not, it’s a bit like sitting in an umpires chair during a tennis match; lots of noise, lots of to-and-fro, discussions on each move and never far away from comparing companies against each other. One of the most prescient things i’ve heard a technology CEO say was from Steve Jobs, when he told an audience in 1997 that “We have to get away from the notion that for Apple to win, Microsoft have to lose”. Certainly, from the time the first iPhone shipped onwards, Apple have had a relentless focus on the end user of their products. Enterprise IT is still driven largely by vendor inspired fads and with little reference to end user results (one silly data point I carry in my head is waiting to hear someone at a Big Data conference mention a compelling business impact of one of their Hadoop deployments that isn’t related to log file or Twitter sentiment analyses. I’ve seen the same software vendor platform folks float into Big Data conferences for around 3 years now, and have not heard one yet). I passed this onto to the team in my last company that sold to big retailers. At least four board level teams in large UK retailers got to see that video and to agonise if they could replicate Tesco’s work in their own local operations. And I dare say the salespeople bringing it to their attention gained a good reputation for delivering interesting ideas that may help their client organisations future. That’s a great position to be in. With that, i’ve come full circle from and back to Tesco. Consultative Selling is a good thing to do, and that folks like IBM are complete masters at it; if you’re ever in an IBM facility, be sure to steal one of their current “Institute for Business Value” booklets (or visit their associated group on LinkedIn). 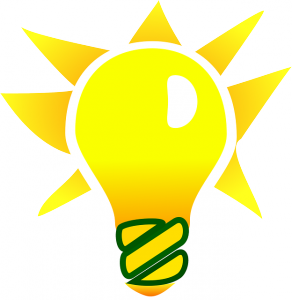 Normally brim full of surveys and ideas to stimulate the thought processes of the most senior users running businesses. We’d do a better job in the IT industry if we could replicate that focus on our end users from top to bottom – and not to spend time elbowing competitors instead. In the meantime, I suspect those rare places that do focus on end users will continue to reap a disproportionate share of the future business out there.